If MK Dons are to get their season back on track tonight (Tuesday), they will have to overcome one of the best home records in the division. Dons travel to Rodney Parade for the rearranged fixture against Newport County, who have lost at home just three times all season. They have also humbled Leicester City and Middlesbrough recently on their visits to south Wales, setting them up with a hotly anticipated FA Cup clash with Manchester City on Saturday. Paul Tisdale's side are in the midst of a dreadful run of form, picking up just seven points from a possible 30, without a win on the road since November 3 and out of the play-off spots for the first time since September after Saturday's 3-2 defeat to Swindon Town. "Despite our away form, I go into away games expecting, hoping, planning and plotting for a win," said Paul Tisdale. The fixture was due to be played on December 15, but a waterlogged Rodney Parade saw the game called off 20 minutes before kick off. That day, Newport were sat sixth in the League 2 table and Dons were top, but since then, both sides have slid down the standings, with Dons now eighth and Newport 13th. The sides have met just once previously - a League Cup encounter in 2016 which saw Dons come from 2-0 to win 3-2. Referee Kevin Johnson takes charge of the game. He has dished out 90 yellow cards and three reds in his 31 games this season. 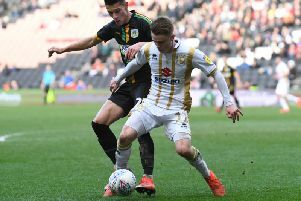 Johnson was last seen by Dons fans sending off Scott Wootton on the opening day of last season against Wigan at Stadium MK.